Were you one of the fortunate few to score an Amazon Echo Show or Echo Spot for Christmas before they sold out [source Bloomberg]? Or perhaps you received a shiny new Echo Dot or another Echo device? Hooray! Well, then it’s time to celebrate! How? By checking out 15 cool accessories and add-ons that make the world’s best smart speakers even better. Not the “Accessories” You Were Expecting? 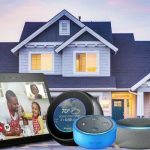 😲 Check out these 17 Awesome Smart Home Products That Work with Alexa. 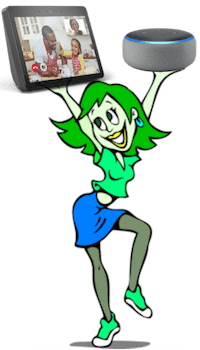 If you were one of the lucky ones to get a 2nd Gen Echo Show despite it selling out early in the holiday season, then we would like to say congratulations. Now, why not give it a little lift and some rotating action. 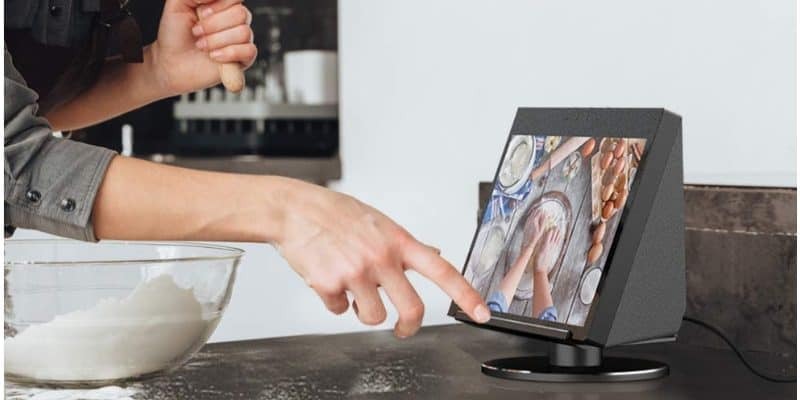 The YoFeW not only gets the Echo Show off your counter, but it also gives it just the right amount of tilt. Best of all, you can rotate it 360 degrees. We think it looks pretty stylish too. This is currently Amazon’s Choice for a 2nd-Gen Show stand. Take one for a spin today. 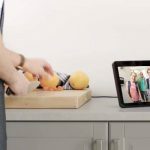 Like the YoFeW stand for the 2nd Generation, the YoFeW Echo Show stand for the 1st-Generation model is also Amazon’s Choice. Similarly, it is designed to fit the 1st-Gen model perfectly, give your Echo a lift off your counter or side table, and provide a 360-degree swivel. It also has a click-in-place capability to let you lock it in place, once you have found the perfect position to the latest episode of The Man in the High Castle, Mr. Robot, or Sneaky Pete. It doesn’t score as high on the awesomeness meter as the 2nd-Gen stand, because it tipped over when we were installing the Show into it. We suggest putting it in front of a wall if you plan to use this in a high traffic area. Our thanks to Cindy Xiao for this video “showing” the stand in action. While we typically don’t recommend screen protection for devices, we think having a little extra protection on the Show is prudent. This counts double if you plan to keep it in the kitchen, where splashing might be an issue. While there is no screen protection product we feel comfortable recommending for the 2nd Gen show at this time, customers are very satisfied with the OMOTON Tempered Glass Screen Protector for Echo Show 1st Gen. It is also Amazon’s Choice. The Echo Spot is one of our favorite devices. Small and compact, we think it makes a great bedside companion. We love being able to see as well as hear our weather reports first thing in the morning. I don’t know about you, but I typically take a bottle of water to bed with me every night.Whether this is in your living room, kitchen or by your bedside, the Echo Spot Adjustable Stand gives it just enough lift to avoid inevitable spillage. However, the biggest benefit, according to customers, is that it gives an excellent boost to sound quality. It also adds a nice bit of tilt and it looks stylish too. It comes in white or black to match the color of your Spot. Or heck, feel free to mix it up if you like a bovine look 🐄. Our thanks to GadgetPrime for the epic stand video. If you would rather mount your Echo Spot on the wall, check out the highly rated HumanCentric Wall Mount. It includes an adjustable bracket and provides both horizontal rotation and vertical tilting. The mount comes with drywall screws and anchors so installation is super simple. It also makes the Spot sound better. We think this would make for an excellent smart-home control installed in an entryway. Ooh, perhaps mounted in a breezeway or even a garage? Very human-centric, indeed. 👓Looking for Echo Dot Cases? They are right after the wall mounts 👇🏽. Out of all the accessories we reviewed, this is one of the most popular and highest rated on Amazon. Customers love how easy it is to install and use this portable wall mount. Ideal for your bathroom or kitchen [or anyplace else you want to put a dot], the Bovon Outlet Wall Mount Hanger Holder Stand for Echo Dot 3rd Generation helps Alexa hang out in an Elegant fashion. This stand helps you save space and eliminate messy cords while hiding the Echo Dot’s cords inside of a plastic case. Best of all, there are no mounting screws or tape. You just plug into an existing wall outlet. Plus, it looks cool too. Haven’t got the 3rd Generation but rather a 2nd Generation Echo Dot? Not to worry. The BonFook Outlet Wall Mount Hanger Stand for home voice assistants provides a very similar solution for your 2nd-Gen Dot. Ahhhh. No more kooky cable clutter. We like that 👍. Another nice wall mount for the Echo Dot 2nd-Gen is made by Upduro. Wires be gone! This stand also hides that unsightly wire-y mess. The Echo Dot 2nd generation fit perfectly in our test. The company claims that the mount is crushproof and “dushproof” [dust proof…hmmm?] for the Echo Dot to boot. It comes with an illustrated step-by-step guide for installation. However, we are very confident you can figure this out all on your own. With an Echo Dot carrying case, you’ll never be lonely again. Why? Well, you’ll never have to leave home without Alexa! If you like being on the go, the BASENOR Travel Protective Hard Case Cover with Carabiner will let you take your snazzy new Echo Dot 3rd Generation anywhere. The inner-mesh pocket provides enough space to store USB cable and charger, which can protect your Echo from scratching. And two provided carabiners [we love this word] make it easy to hang on a backpack, bike, or wherever you like [hey that rhymes! 🤣]. If you looking to unplug Alexa and still give her plenty of juice to satisfy your demands, look no further than the Zero Lemon Echo Dot Battery Charger for your 2nd Generation Echo Dot. The powerful 7500mAh Li-polymer battery charging base will keep your Echo Dot working for an additional 8-12 hours at full charge. 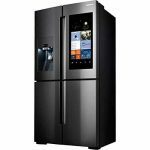 This should be plenty of power whether you’d like to take your Echo Dot on a road trip or even use her while working or relaxing outside. Come to think of it, you could even put Alexa in your car with this add-on [requires a hotspot internet connection]. Hurry up and make one of these for the 3rd-Gen Dot please! There are many cool wrapper cases [sometimes also called “skins”] available for the Echo Dot. The pink one pictured here is one of the most popular for the 2nd-Gen model, and it has to be our favorite style [in black]. Want to make your 2nd-Generation Dot look just like a 3rd-Generation dot with the fabric outer wrapper? Now you can with the VERY affordable Amazon Echo Dot 2nd-Generation Fabric Case. Thanks to Brandon Hicks for the thoughtful video review. Another one of our favorite wrapper cases for the 2nd-Gen Dot is the AWINNER Silicone Case. It comes in a multitude  of vibrant colors to fit just about any preference or mood. I’m no angel, but I’m a fan of this cute and stylish way to dress up the Echo Dot 2nd Generation. This item has a near perfect rating on Amazon. In fact, it is one of the highest rated products we have seen there. I suppose it’s would be bad karma to give a negative rating to an angel 👼. It is hand carved and the company claims it will not interfere with Echo Dot’s sound or function. Something to be aware of…a few customers have [happily] said is larger than they expected it to be. You can check the reviews on Amazon for actual customer photos of the product. The same company makes a reindeer and a snowman holder too. If you want to make Alexa and your Echo Dot 2nd-generation OR 1st generation a little wiser, the Owl Statue Echo Dot holder is a real hoot. Ideal for a coffee table or maybe even a mantle, this decorative piece gives Alexa your home a little added animal magnetism. Word to the wise: both the angel and this owl are purely decorative holders for your Echos. That is, they don’t do anything other than look good. Still, they are hugely popular and highly rated on Amazon. The owl is also currently “Amazon’s Choice” for a decorative Echo holder. Another great accessory to help with Alexa on the go is the Smatree Portable Battery Base for Echo 2nd Generation or 1st Generation smart speakers. While there were problems with the previous version of this base, the manufacturer has addressed them and the new version will no longer turn off when the Echo goes into standby mode. Cool. Judging from the Amazon customer reviews, this is true. More than one owner is delighted to use the base with their Echo while sipping drinks on their deck. Cheers to them!🍸🍷. Here’s a cool way to add a little bling to your Echo. It’s the Chandelier Echo Speaker Stand with Crystals! Wow, if there was ever a question about the design of the old generation Echo Dot speakers being too drab, this item certainly solves it. Decked out from top to bottom in dozens upon dozens of crystals, this covering for your 1st Generation Echo device gives it a more refined look. Pardon, me but could pass the Gray Poupon? LOL. 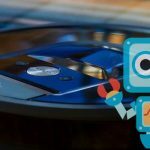 Amazon Echo Cases, Mounts, Stands, Racks & Skins – What Do You Think? Our staff worked really hard on this review. We hope you enjoyed it. 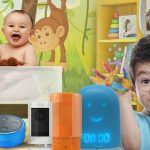 So what do you think of these Amazon Echo cases, mounts, stands, cases, and skins? 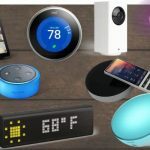 Do you plan to purchase any of these add-on accessories for your Alexa device now or sometime in 2019? Please leave a comment below and let us know. We would love to hear from you. Enjoy your Echo devices. Happy New Year! If you liked this article, would you mind sharing it using the social media buttons on this page? If you enjoyed reading this, you might also like some of our other articles on Echo and Alexa. We’ll list a few of them below. Thanks for stopping by! Tim Brennan is Founder and CEO of Writeinteractive, Inc., a professional services firm that helps innovative companies solve technical content challenges to address real business goals. 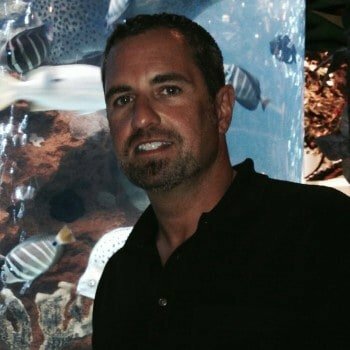 Brennan is a father to two sons, and he manages the day-to-day operations of Writeinteractive. He is also an active blogger, obsessive Star Wars fan, and an SEO fanatic. He has worked as a technical writer in various industries for over 25 years. Tim holds a B.A. in Journalism from Northeastern University.